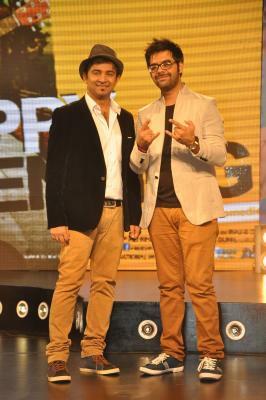 Sachin-Jigar created four options for Chad gayi hai"
Mumbai July 13 (IANS) Popular composers Sachin-Jigar created four options for the newly released song "Chad gayi hai" from Akshay Kumar-starrer "Gold" before they zeroed in on the final one. "While we were working on the film for over one and a half years this song came up at the last minute and was finished in a span of 20 days. We created four options for this song before we zeroed in on a final selection. We wanted a modern sound that didn t take away from the era that the film is based on " Sachin Sanghavi said in a statement. Drawing inspiration from the legendary composer R.D. Burman Sachin-Jigar produced the song using beer bottles mugs and cans. The composers roped in Vishal Dadlani as the singer who had to embrace a Bengali accent to complement the intoxicated reel character of Akshay. The track also features popular tabla player Zakir Hussain s younger brother Taufiq Qureshi for rhythm arrangements. "R.D. Burman has been a great inspiration to us and for Chura liya... he had used a glass for the song. As a musician he used a lot of real elements to create music and since the song was about getting intoxicated we thought why not try using actual liquor bottles and give a more real-time effect to the music " said Jigar Saraiya. "We used close to 100 bottles and cans of different brands to procure the right sound. Infact we had to import a few bottles but eventually we could only use a few to suit the sound of the song " he added. "Gold" a historical sports drama is inspired by India s first Olympic gold medal. The film traces the "golden era" of Indian hockey through the journey of Tapan Das a young assistant manager in 1936 who dreams of playing for an independent nation. Directed by Reema Kagti and produced by Excel Entertainment the film will release on August 15.